UK police have arrested WikiLeaks founder Australian Julian Assange after he left the Ecuadorian Embassy. WikiLeaks has alleges that Ecuador illegally terminated Assange’s political asylum in violation of international law. 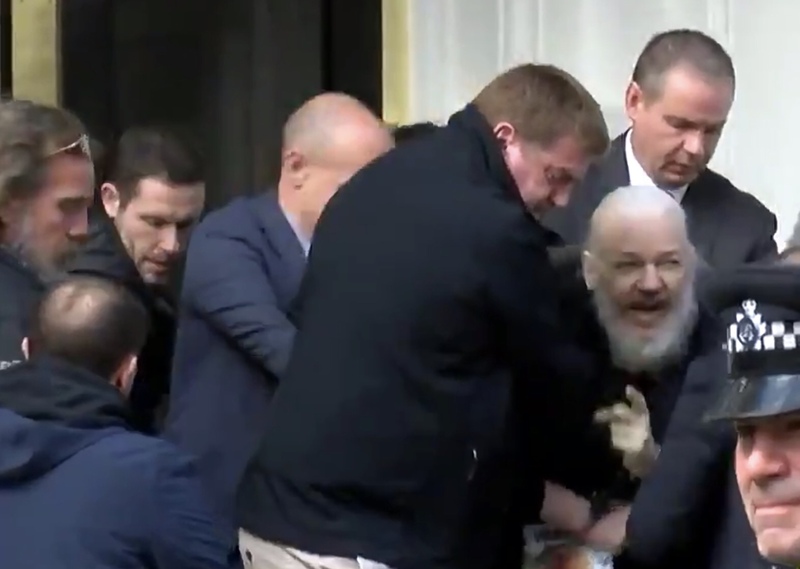 The police have taken Assange into custody at a central London police station where he will remain. Assange will be presented before Westminster Magistrates’ Court as soon as is possible. The UK police said they had a duty to execute the warrant, on behalf of Westminster Magistrates’ Court, and was invited into the embassy by the Ambassador, following the Ecuadorian government’s withdrawal of asylum. Assange has been living for the past seven years in the Ecuadorian Embassy, for “failing to surrender to the court” over a warrant issued in 2012. Russia slams Assange’s Arrest saying it is ‘ the “Hand of Democracy Strangling Freedom“. Assange founded WikiLeaks in 2006, and came to international attention in 2010, when WikiLeaks published a series of leaks provided by Chelsea Manning. These leaks included the Collateral Murder video (April 2010), the Afghanistan war logs (July 2010), the Iraq war logs (October 2010), and CableGate (November 2010). Following the 2010 leaks, the federal government of the United States launched a criminal investigation into WikiLeaks and asked allied nations for assistance.